I love mine!! It is wonderful for Crafting, Designing and Cutting. What I especially like is creating my own images to cut out. For example, I love gingerbread boys and girls . . . and I wanted to dress them up — overalls and an apron . . . I had a stamp and a punch for the gingerbread kids, but I needed to design my overalls and the apron. I was able to design it, cut it out and make adjustments as necessary to fit on my gingerbread punch outs. Plus, I could have had the Cameo cut out my gingerbread kids. I find the Silhouette Cameo easy to use and to create some truly fun projects. I can make templates for boxes and bags and the Cameo will cut them out for me. All I need to do is decorate them and assemble them. This is truly a time saver for me when I have dozens of cards or boxes to make at one time. It is a “must have” in every craft room! 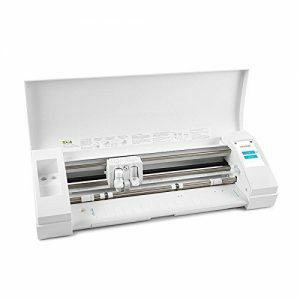 It is worthwhile for you to check out other cutting machines in order to find the one that works best for your needs. Thanks for stopping by and shopping with me! Riding a bike is great exercise . . . and fun! 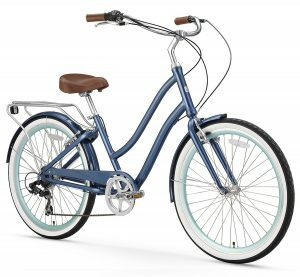 This sixthreezero EVRYjourney Women’s Hybrid Cruiser Bicycle is made for comfort . . . and I’m all about comfort when it comes to riding a bike. I like making short trips to the store for a few items. Maybe to meet friends for coffee . . . and just to get out and take some pictures. I like being able to have a comfortable seat and the handlebars where I can sit up and not hunched over. It may not be stylish like for racing, but I’m not racing . . . I’m going for an enjoyable ride around town and picking up a few items or going out to take pictures. I get some exercise and have an enjoyable ride. I have a rack if I purchase something. I can also carry my camera, a sandwich and water. Yes, I can wear a backpack, but sometimes I like the freedom of not having anything strapped to me. I’m all for comfort and this bike delivers!! This is another Roosterfin Game — A card game of war played on treasure islands. For 2 to 4 players ages 7 years and up! I think this is a really fun game!! I think it’s a winner and will go in my Family Game Night game rotation!! As I said earlier, this game is a winner!! I think it’s fun . . . use some math skills . . . maybe some strategy is involved . . . It is definitely a good time for all players. I know I’ve reviewed quite a few games, but for spring and summer you may be going on vacation . 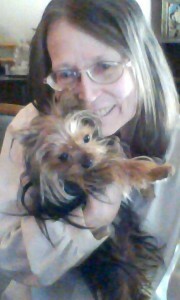 . . visiting relatives . . . relatives visiting you . . . and the kids are going to want to keep busy . . . I think playing games as a family is a wonderful thing to do throughout the year . . . and especially on vacation and while visiting or having family visit. White Mountain Puzzles has this excellent 1000 piece jigsaw puzzle — Readers Paradise for you and your family to enjoy. During all times of the year is the right time to set out a jigsaw puzzle for the whole family to enjoy. White Mountain Puzzles features oversized 100% recycled blue chipboard pieces. The pieces are large and thick which makes them easy to pick up. This 1000 piece jigsaw puzzle measures 24″ x 30″ when completed. I was drawn to Readers Paradise because I loved the detail and could spend hours exploring such a unique shop. It would be the type of place I would feel comfortable finding a cozy spot to read. This is a definite “must have” for the book lovers in your family. Yet there are a few issues . . . the image is not entirely in focus, some pieces have been bent and some have experienced missing pieces. Some have had issues with the interlocking pieces fitting too snugly together. I suppose it is all a matter of personal preference . . . but since this is the inside of a bookstore, one would expect the shelves and the books to be clear and crisp . . . Compared with other White Mountain puzzles, this one doesn’t seem to have the quality one would expect. So, be sure to read the reviews and decide for yourself whether Readers Paradise is the right jigsaw puzzle for you. RoosterFin has another fun game for me to review! 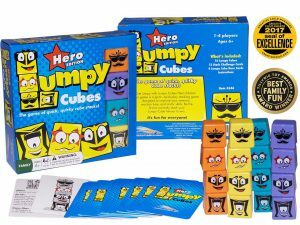 It’s Lumpy Cubes Family Board Game — Hero Edition for 1 to 4 players ages 6 years and up. But can you match the pattern faster than your opponents? This is truly a fun game for the whole family! Young and old alike will enjoy this game!! You can also play alone . . . set a timer and see if you can beat the timer. Or you may time yourself with a stop watch to beat your best time. There are many ways to enjoy this game. I’m sure your “wish list” has grown! !